Two studies have unveiled widespread flaws in the reporting of animal experiments — the latest in a series of papers to criticize shoddy biomedical research. "The researchers used computer simulations to show that the levels of attrition they saw might seriously affect the results of the studies. If biomedical scientists were biased in how they dropped animals — excluding outliers that gave extreme data values, for instance — then results would be fourfold more likely to find a statistically significant result that was in fact just due to chance, and could overstate the actual effectiveness of treatments by as much as 175%, the team says." A surprise nursery of one of the world’s most elusive whales has been spotted in photographs taken from planes. Narwhals, the single-tusked whales of the Arctic that have been dubbed the “unicorns of the sea”, are classified as “near-threatened” by the International Union for Conservation of Nature. But protecting these animals is hard, partly because we don’t know how many there are. The animals spend about 80 per cent of their time under the water’s surface, and more than half the year in deep offshore waters below dense pack ice during the dark Arctic winter. Scientists have found that the mutated Kit gene is responsible for the piebald colouration of animals (white patches on head and belly of cats, dogs and many farm animals). The research team tracked the melanocytes (pigment cells) which are produced in the embryo and move through the skin towards the front of the animal as it develops in the womb. The toxic cane toad is causing ecological havoc in Australia, causing the dramatic decline of many lizards which have decided to prey on the invasive amphibian. Cane toads were introduced in the 1930s to control crop pests, but they have spread, and are causing problems for many native species of animal such as the yellow-spotted monitor lizards whose populations have fallen by 90%. Scientists are now training monitor lizards not to eat the toads, using non-lethal doses from a young cane toad. Those lizards which became sick did not try to eat cane toads when released into the wild. 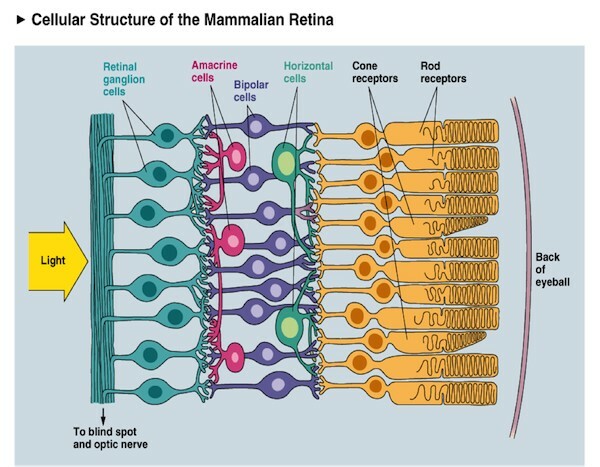 In the vertebrate visual system, all output of the retina is carried by retinal ganglion cells. Each type encodes distinct visual features in parallel for transmission to the brain. How many such ‘output channels’ exist and what each encodes are areas of intense debate. In the mouse, anatomical estimates range from 15 to 20 channels, and only a handful are functionally understood. By combining two-photon calcium imaging to obtain dense retinal recordings and unsupervised clustering of the resulting sample of more than 11,000 cells, here we show that the mouse retina harbours substantially more than 30 functional output channels. These include all known and several new ganglion cell types, as verified by genetic and anatomical criteria. Therefore, information channels from the mouse eye to the mouse brain are considerably more diverse than shown thus far by anatomical studies, suggesting an encoding strategy resembling that used in state-of-the-art artificial vision systems.